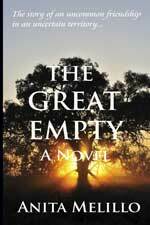 The Great Empty: A Novel was a great novel. Donovan is fully-rounded character. He is impulsive, mischievous, reckless and loveable. Someone once told me that the difference between boys and girls is that boys will throw themselves out of moving vehicles just to see what will happen. Donovan is that boy. Melillo writes her main character in a way that causes adults to chuckle and will keep young readers fully engaged with a desire to know what happens next, and if young Donovan will escape the perils he faces. Melillo’s writing employs a strong sense of humor but at no time is the plot sacrificed for that laugh-out-loud moment. Everything that happens within the course of the story line could realistically happen in life and that very sense of realism is enchanting. On the other hand, my heart tugged a bit as a parent. The idea of not knowing where one’s child is and the danger Donovan faces hurts the soul. His family is worried and they have good reason. That the narrative switches back and forth between Donovan and the search for him, plays on the emotion of the reader. They’re worried and they have good reason. The pacing of the plotline within The Great Empty: A Novel made the novel a quick but satisfying read. Either Melillo has a talent for conveying action in the least amount of syllables possible or heavy editing went into this great work. The end result is a story that is fast paced and leaves the readers with their hearts pounding. The Great Empty: A Novel is a delightful read for all ages. The author made the admirable choice of not simplifying language for young readers so that the story comes off with feel of the masters of children’s classics. You can connect with with Anita Melillo on Goodreads, Facebook and Twitter @AnitaMelillo.